Warren Buffett claims that gold is worthless because it doesn’t produce anything. Fair point, but what if the other sectors of the economy also stop producing? “If you think of gold, the only way gold loses is if normal business and private sector cycles come back. If that is the case, gold goes back 100 dollars per ounce. 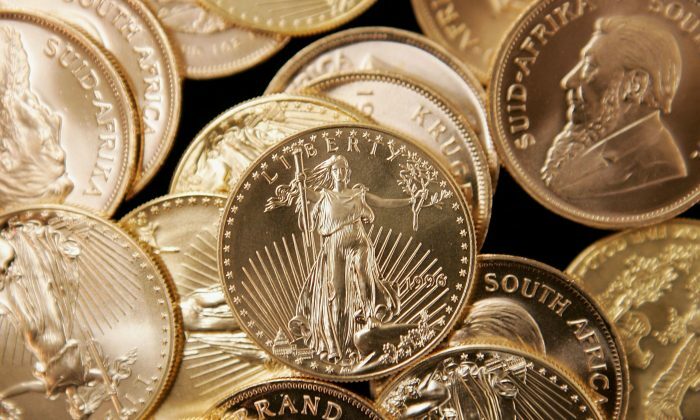 The other outcomes—deflation, stagflation, hyperinflation—are good for gold,” said Viktor Shvets, global strategist for investment bank Macquarie Group, in an interview with Epoch Times. So gold wins in three out of four scenarios, but none of the three are particularly appealing. He believes that aggressive action by the world’s central banks after the financial crisis has covered up a lack of private sector productivity. Also, the movements of central banks and governments have replaced private sector investment signals such as earnings and employment data. So everything comes down to confidence in central banks. “If people become more confident, gold will ease back. But when the chickens come home to roost, gold will come back,” he said. Gold futures have rallied 26 percent this year after the Federal Reserve shook confidence in its ability to manage the economy by raising interest rates last December. Junior gold mining stocks, the companies most sensitive to gold price increases, rallied 155 percent this year. The lack of success of conventional monetary policies in spurring economic activity has prompted some Fed officials to call for more unconventional methods in case the economy turns south again. How do you force people to do things they are reluctant to do? According to Shvets, this may just be the beginning as investors and citizens reject these policies and are looking for alternatives like gold, physical cash, bitcoin, and real estate. “Bitcoin and gold can both be prohibited by the government. How do you force people to do things they are reluctant to do? The way to do it is to close down alternatives like real estate, cash, and gold. You could force people underground, hoarding cash with warehouse receipts, or warehousing gold illegally,” he said. In some ways, this is already happening. When a Swiss pension fund asked one of the bigger Swiss banks to pay out a larger amount of cash to save the negative rate penalty, the bank denied the request, according to a report by Schweizer Radio und Fernsehen in March. Where will all this lead? Shvets believes there has to be a reset of the financial system to get rid of a couple hundred trillion dollars of debt. “Right now we are still on the U.S. dollar standard. Since the Bretton Woods system ended in 1971, we are on the U.S. dollar standard. How will the monetary system rebase itself? Is it going to be gold, is it going to be a global currency? British economist John Maynard Keynes was already suggesting in 1944 to create a global currency,” said Shvets. The new global currency could only be the derivative of five international currencies issued by the International Monetary Fund (IMF). It is called Special Drawing Rights (SDR). It represents the right to draw on members of the IMF and get paid in the components of the basket, which is made up of the dollar, euro, yen, pound, and as of Oct. 1, 2016, Chinese yuan. Globalist academics, central bankers, as well as the IMF itself and other international organizations have started a massive publicity campaign in 2016 to push for the SDR as a global currency. It culminated in the first issuance of a private SDR bond worth $2.8 billion by the World Bank in the Chinese bond market in August. Are we going to have a global currency? “Countries would have to give up their domestic independence. Countries are reluctant to do that. So usually that’s done after the war,” said Shvets. What about a return to the gold standard? Maybe, but also only after the war.